like to "markdown" until Sunday, October 16th. Counting on Candy Corn includes math materials for teaching addition with sums up to 10. This activity uses ten frames with pictures to enhance children's understanding of addition. We have included materials for modeling, cooperative group practice, individual assessments, and a follow-up center activity. We have also included different levels of materials for finding sums, writing the whole equation, and finding the missing addend. 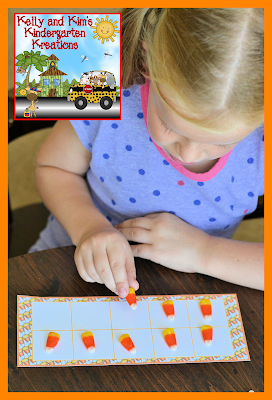 Read on to get a look into this fun and engaging activity using the very adorable candy corn clipart from Scrappin' Doodles. 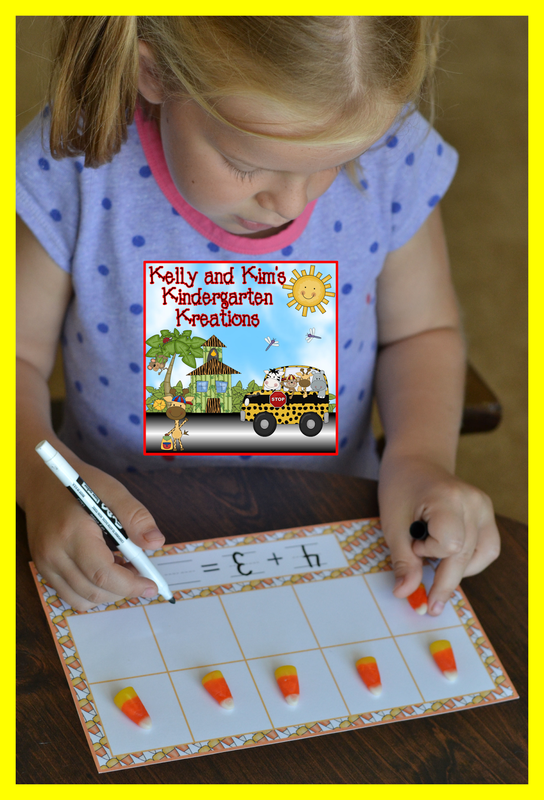 Children will look at the candy corn shown on the ten frame to find the sum of the equation provided. Children can use a dry erase marker to write the answer. 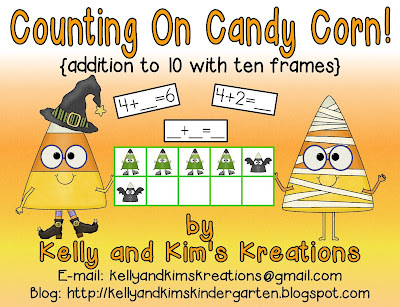 These ten frames show two different sets of candy corn dressed up and ready for Halloween. Children are to write the equation that matches the picture shown. Here the children need to figure out the missing addend in the equation. You can use counters, candy corn erasers, real candy corn, or anything else you have available for the children to use to help them accomplish this task. They will fill the missing addend with a dry erase marker. You can use these cards in so many different ways. You can differentiate your groups by giving one group the finding sums cards, while another group uses the writing equations cards, and one group has the missing addend cards. You could also give each group a sampling of each of the cards in order to practice all of the ways shown. We have included three different assessments for you to use to meet the needs of your students. Each one is two pages which we copy back to back. You can use them to check for understanding, for reteaching in a small group setting, or even for homework! We like to use real candy corn while making different combinations to make a sum. The children love the added bonus of getting to eat them when we are done! You can also use candy corn erasers, counters, or anything else you would like to use! We have included two different ten frame mats for you to choose from and a recording sheet too. The first mat is your basic ten frame. Children can use this mat to count objects, make sets, add with sets of ten or less, or anything else you choose. The second mat includes a place for the children to write the equation with a dry eraser marker after they have been laminated. The next ten frame can act as an assessment or recording sheet. The children can use the ten frame on the paper to build their equations and then record them in the spaces provided below. Our children love this center! Children will match the top and middle sections of the candy corn by placing the correct numeral over the set shown. They will then add to solve each equation. We have included a recording sheet also. Children will record the equation next to the picture that matches their completed card. We hope you enjoy our Counting On Candy Corn activities!